The bad news first: there is no single number that confirms your social media’s ROI or denies it. But this isn’t news. People have been saying this for a while. But there’s good news: if you think strategically and plan ahead, you can learn a LOT about how well your social media campaign is performing. So let’s get into the bad news. Why isn’t there a magic number? Let me ask you a question: if you’re watching football this Sunday and you see a beer commercial, what was the ROI on that commercial? It can’t really be measured. It’s partially because we can’t know exactly who saw the ad. But it’s also because commercials are usually focused on making the audience aware of a product or company or idea. Also note, that companies do not buy a single playing of a commercial (well, except Apple in 1984, but are you going to compare yourself to Apple?! …Really?!). They buy lots of commercial time, not just because they get a wider audience, but because commercials needs lots of viewings before their break through most people’s shields. Geico and Progressive Insurance companies both have a series of commercial types – in the hopes that if an animated lizard doesn’t get your attention, maybe a talking pig will. And notice the calls to action in most commercials. Rarely do they say, “Now buy XYZ.” You’ll see calls to action that direct you to particular web sites. Many pharmaceutical ads end with calls to read side effects in a major magazine. Maybe they will go so far as to ask you to look for their products on store shelves. They don’t ask you to buy, they ask you to move to the next step in the funnel. Commercials have the added issue of not being trackable. No one knows if I’ve seen 100 Coke commercials this week or just 80. So, no – you really can’t measure the power or value of a single commercial. This wasn’t just an academic exercise, but a way to re-establish what the value of social might be. How are you using social media in your talent acquisition strategy? 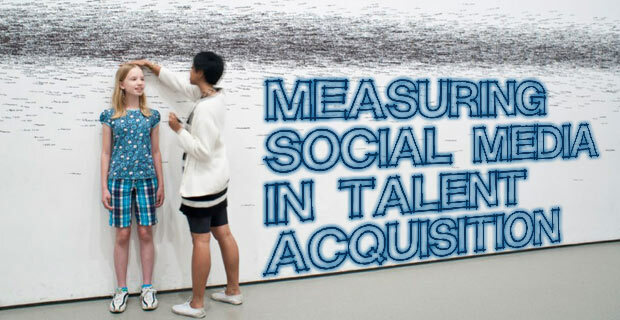 For most companies’ talent acquisition teams, social media is primarily or exclusively auxiliary. It’s hard to think of a single medium or large company that uses social media as it’s main marketing channel. Ads, job boards and SEO are primary channels to drive applications, and social media supports those channels. Social is better at raising awareness and interest, not in closing the deal. Social is part of a larger strategy to tell your story to people who might not know you already, to prime them for application at a later date. Social is most effective establishing, extending and filling your candidate pipeline. If we look at some data, we commonly see 60 to 90 day lags between first click and conversion for traffic from social. Social doesn’t have higher conversion rates or lower bounce rates. These are all hints as to how we can use social media effectively. Instead of focusing on a single number that validates and justifies our activity, we need to think very differently about how to measure social because we also need to learn how to think differently about what role social really plays. Many people will say that you can’t measure social media ROI, and that’s simply not true. There is no shortage of data points we can look at with social media to help us understand who is using it, how they are using it, how people interact with it, where it can drive them, and how effective is it in driving to a call to action. And so we come to the crux of our argument. The KPIs are there, but you need to define what you want your social media to do. And that’s the good news: The KPIs are there. You can resolve that into an ROI that’s specific to you, but none of it can be done until you define why you have social media. Remember that many of your targets are already being served very well with job boards, LinkedIn, Google and ads. They don’t need to follow you on social media to find out that you have job openings. They signed up for job alerts or newsletters. Put simply, they’ve already applied. What more do you want from them? So, if people who want to spend time on your site are already being driven there, what role does social media serve? And if that role is different, can you expect social media to have the same ROI point as those other channels? The way we see it, traffic is like juice from an orange. There’s plenty of juice in those initial squeezes. Traffic from SEO and standard brand awareness is going to get people on the site. Most medium and large companies wouldn’t have to post a single job and they would get resumes sent to them out of sheer brand recognition. Squeeze a little harder to get even more applications by buying media and posting to job boards. But that last squeeze, those last drops of juice, take the most effort. That’s where social media really shines. That’s also why, when you look at the data, social seems “least effective” at drawing applications. It’s not that social isn’t doing its job, it’s that social has been given the most elusive targets: the people who are nowhere near interested in applying. So, if you want to show that your social media is valuable and useful, the first step is to define social’s role in drawing candidates in. You need to define what social should be doing for you. Then you can figure out what the KPIs are. Remember that social, like a commercial, can’t do all your selling for you. So, focusing on conversion rates is asking to be disappointed. Instead, you need to see how well it is driving people one step closer to conversion. In some circles, these steps are called “micro-conversions.” For example, if I can get you to subscribe to my free newsletter, that’s not a true conversion (you didn’t apply), but I know that people who subscribe are far more likely to apply in the long run. Hence, subscribing to the newsletter is a micro-conversion. Think of it like a store owner: the same way that someone who walks into your store is far more likely to buy than someone who is looking at your website. That doesn’t mean that you kill your website because “it isn’t driving sales.” People who visit your website are more likely to visit your store, because now they know who you are and how to leverage your existence. We think about social media metrics as a series of concentric circles: on the outside is awareness: these are all the people who have become aware of you and your brand. Next would be people who engage with your brand on social media channels. They like things. They comment on things. They retweet things. They see what you are doing and they are engaging with it. They must be aware of your brand in order to engage with it, so that’s why they are in the larger circle. Inside the engagement circle are the visits to your career site, content pages and job descriptions. To get this far, they must know something of your brand and clicked a link on a social channel to visit. But clicking is a deeper kind of engagement than just liking something. Plus, it shows the candidate a lot more branded information and gives them a clear call to action (look at a job! or click on a job!). Thus, it is like engagement, but more valuable. Finally, there are the people who, after clicking the link on social and reading your content, decide to apply. This is the gold. It should go without saying that the closer to the center the candidate gets, the more valuable the channel has been to them. And, the more valuable that channel has been for you! Micro-conversions measure the candidates’ movement from one circle to the next. Step one – from unaware to aware, is simply measuring followers and fans. The step from aware to engaged is measuring the number of engagements. The step from engaged to clicking, is the number of clicks from social. And of course, the step from clicking to applying is the number of apply clicks. With these four metrics, you can create a clear picture of the value of your social media. None of these metrics are new. What’s changed is that you can now place them in the proper context. And by understanding, that the people you can drive via social are not the ones who are already applying via job boards and ads, you will better understand how to properly value social media. If you’d like to hear the webinar this material was based on, request a link.